Houston Dynamo (black) vs DC United played to a 2-2 draw. 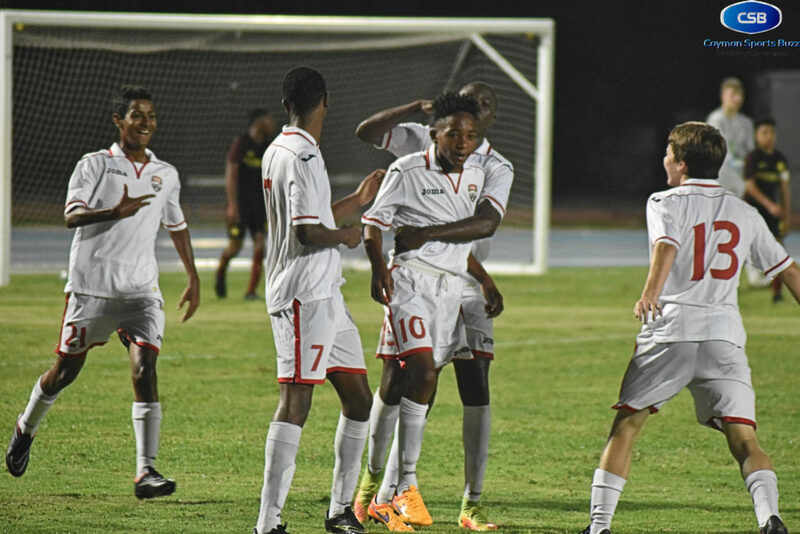 The 2017 Cayman Airways Invitational U15 Youth Football Cup got off to a solid start Tuesday, 2 May, with a full slate of five matches played in two islands. 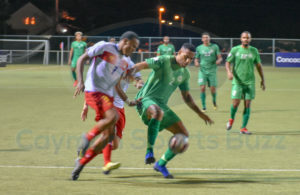 A pair of draws sandwiched the lone win at the Truman Bodden Sports Complex in Grand Cayman, while fans in Cayman Brac witnessed back-to-back shutouts on the opening day of the tournament organised by the West Bay Sports Foundation. Houston’s Diego Gonzalez scored the tournament’s first goal. 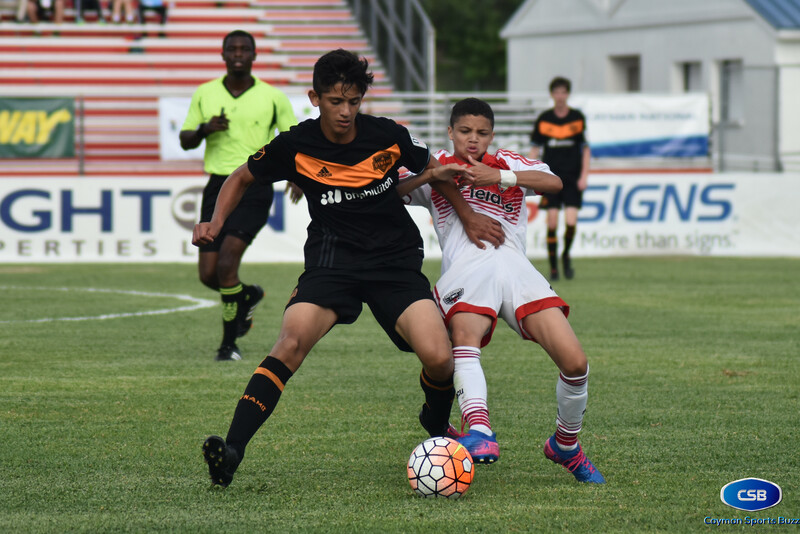 Two Major League Soccer (MLS) academies took the pitch first at Truman Bodden Sports Complex. D.C. United climbed back from a 2-0 deficit to share the points with Houston Dynamo. Houston took the lead in the 13th minute thanks to Diego Gonzalez and preserved the 1-0 advantage through the half. It took seven minutes after play resumed for Rory Fraser to double the lead for Houston Dynamo. With their backs up against the wall, the team from the US capital started playing with a sense of urgency and created chances. 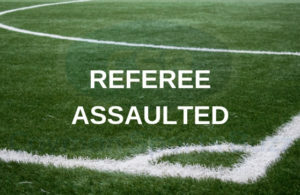 A breakthrough would come in the 51st minute when co-captain Bradley Paz headed the ball into the back of the net to pull his side within a goal. The equaliser came 12 minutes later when substitute Diego Lopez scored seven minutes from full time. The teams walk away with a point each. Houston Dynamo is back on the pitch Wednesday, 3 May, against defending champions Manchester City FC, while D.C. United gets an off-day before also facing the 2016 cup winners. Cavaliers players celebrate a goal against IMG. Jamaican side Cavalier SC took advantage of their pace and speed to create early chances. Alex Johnson scored in the 15th before getting his brace 11 minutes later for the team from Kingston. Isaac Scott joined in the scoring as the clock ticked to half an hour of play to give Cavalier SC a 3-0 lead but IMG Academy would get on the board on the stroke of the interval thanks to Karl Weisenfeld. Cavalier SC appeared to take their foot off the gas slightly, possibly entering energy-saving mode with two other group matches this week and hopeful of more action in the knock-out stage. However, that did not stop them from seeking more goals, even though they appeared not to be urgently pressing that cause. A fourth did come six minutes before the end when Scott added his second to formalise a 4-1 win that would have been wider had not it been for at least one big save by Sam Lee in the IMG goal late in the game. Cavaliers are back in action on day two against Alchemy Soccer Club from Minnesota, while IMG takes on the Cayman Islands National U15 team. Josiah Edwards (10) equalised with an injury time goal for Trinidad & Tobago against Manchester City. In what was billed coming in as potentially the match of the night, the teams felt each other out cautiously in the early going. Manchester City’s James McAtee missed the mark on a 23rd minute penalty kick but his club would take the lead 11 minutes later when Charlie McNeil scored. 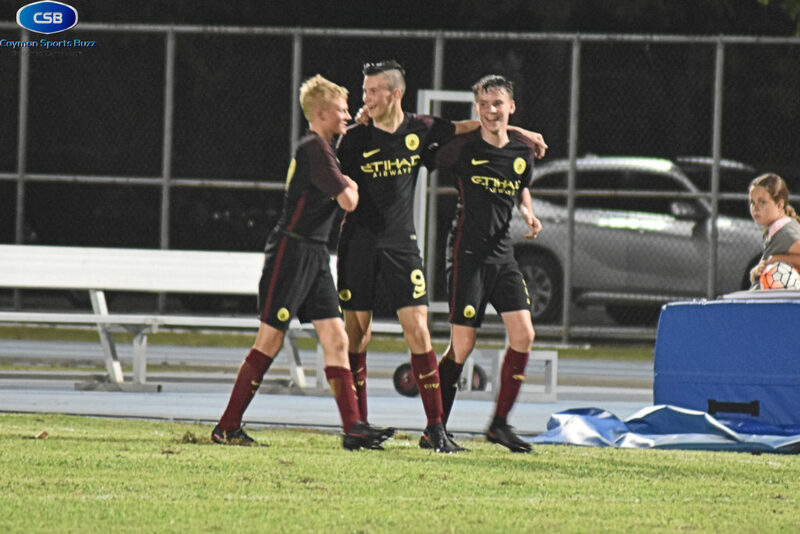 Owen Hesketh made it 2-0 with 20 minutes to play and it looked like City was assured of three points but Justin Araujo Wilson energised the Caribbean side with a 70th minute goal. With three minutes added, Trinidad and Tobago methodically looked for a last-ditch opportunity for a draw. 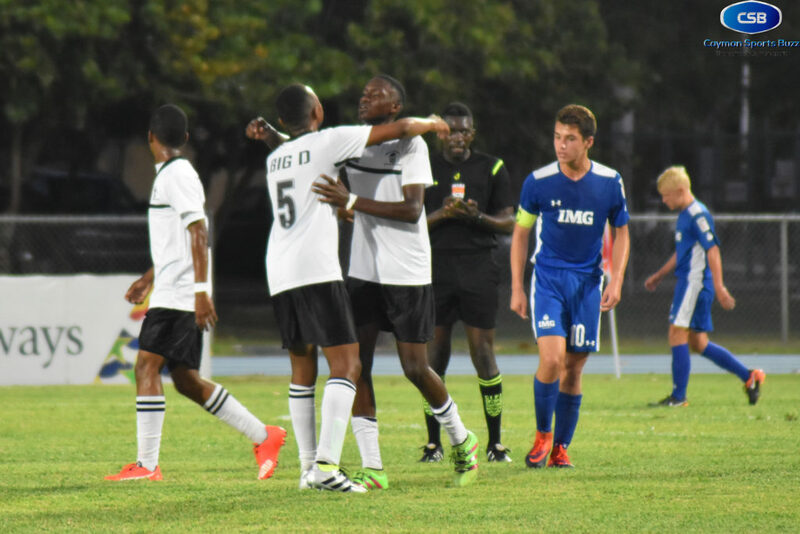 It was not quite carnival but the young men from Trinidad and Tobago celebrated gleefully when Josiah Edwards, who entered as a substitute, got the equalizer in stoppage time. A draw in the end, with a day of rest ahead for Trinidad and Tobago but Manchester City plays for a second straight day when they face Houston Dynamo on Wednesday. Manchester City players celebrate Charlie McNeil’s (9) goal. 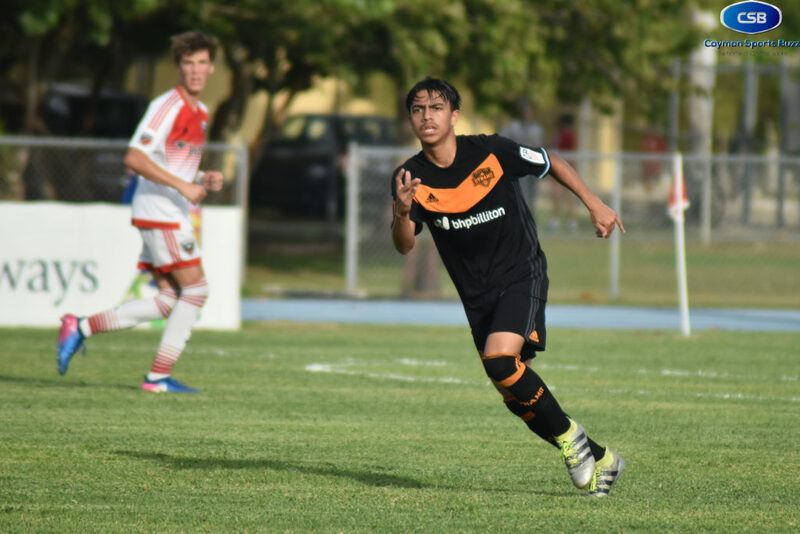 In Cayman Brac, Cuba’s national U15 side built up a 6-0 half time lead over Bahamas Tottenham Hotspur FC after finding the back of the net in the 3rd minute and never looking back. A pair of goals followed in the second 35 with the game already in the bag. Scorers for Cuba: R. Yasniel, O. Perez, P. Sanchez, R. Eraste, J. Madrazo (2), Y. Bullana and L. Herrera. All four teams in Cayman Brac are back in action on Wednesday, 3 May. Bahamas Tottenham Hotspur FC meets La Ceiba and Cuba meet at 6:30 p.m. at the Cayman Brac Playing Field on the Bluff. That game will be followed by Cuba Federation and Harbour View F.C. at 8:00 p.m. Meantime, action in Grand Cayman shifts to the Ed Bush Sports Complex in West Bay. Alchemy Soccer Club from Minnesota will open their campaign against Cavalier Soccer Club at 5:00 p.m., followed by Cayman Islands National U15s playing their first game against IMG Academy at 6:30 p.m. The last match of the evening will be Manchester City F.C. against Houston Dynamo at 8:00 p.m. 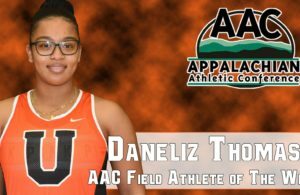 Admission is $8 for adults and $2 for children under 12, so come out early to get a good seat because a packed stadium is expected. 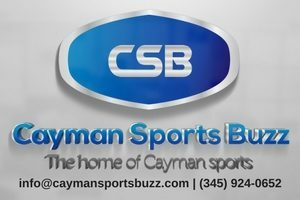 For more on the Cayman Airways Invitational U15 Youth Football Cup, visit: www.caymanyouthfootballcup.ky. BABBYYYY YO MHII LOVE UU DWQ? ?✨.